This year marks the 100th anniversary of the first genocide of the 20th Century when more than 1.5 million Armenians of the Ottoman Empire perished in a brutal campaign of extermination. Through massacre and systematic deportation, the entire Armenian population in that area of the world was violently uprooted from their historic homeland of over 2,000 years in just a matter of years. No segment of the population was left untouched - men, women, children, the elderly suffered unimaginable horrors. Every family lost something and someone. Some people lost everything. The people of California did not sit idly by. As news of the genocide reached America, Californians in Los Angeles and beyond leapt into action to support Near East Relief, America's first major philanthropic effort to aid people in other countries. Near East Relief raised the equivalent of over $2.7 billion in today's dollars to save Armenians, Assyrians, Greeks and other minorities in the Near East region during and after the Armenian Genocide, setting a standard for generosity that would make up a part of ourcity's character for generations to come. Like other groups of immigrants before and since, many of the survivors and their descendants found refuge and hope and the opportunity to create a new life inour great state. They've enriched the fabric of Los Angeles through extraordinary contributions in the arts, business, agriculture, technology, science and in government as well. As the first Armenian-American elected to city office in Los Angeles, I am happy and honored to do my part. 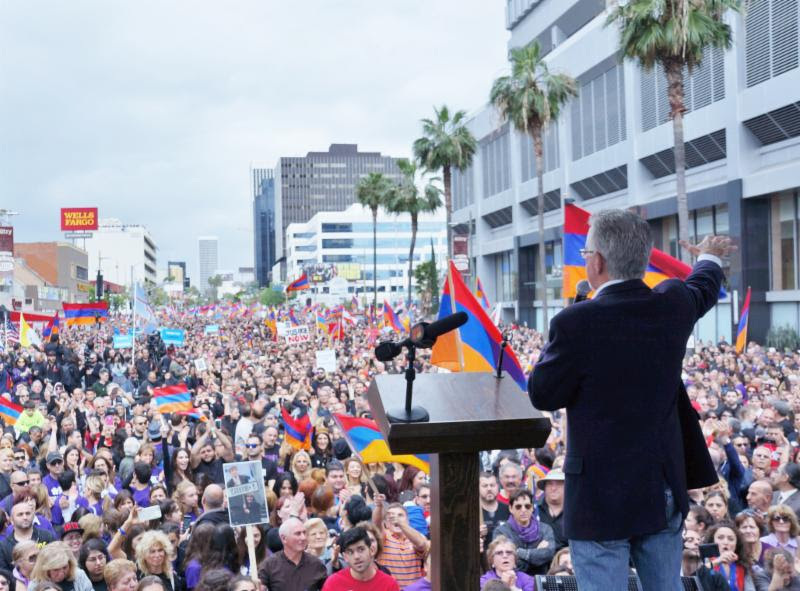 Armenian-Americans have succeeded, against all odds and obstacles, and they have added immeasurably to making Los Angeles the city we all enjoy today. The Los Angeles area now has the largest population of Armenians living outside of Armenia. They are our neighbors, co-workers, family members and friends. Each year, we remember the terrible genocide, which stands as one of the darkest chapters of human history. This year is different. We have reached the Centennial anniversary of the Armenian Genocide. It is a time of mourning, a time to remember, a time to tell stories and a time to shine a light on a still-open wound. The State of California, and cities like Los Angeles and San Francisco held official centennial ceremonies. More than 130,000 people marched in the streets of Los Angeles on April 24 to urge the federal government and anyone who hasn't yet done so to recognize the genocide. Just one day earlier, Mayor Garcetti joined me at the city's official commemoration of the genocide where we planted a pomegranate tree on the south lawn of City Hall. It is one of 100 trees that the city is planting to commemorate the genocide. It is important to remember the genocide of the Armenian people, because the government of Turkey to this day denies that these events ever occurred. Our own federal government still refuses to use the word "genocide" to describe what happened 100 years ago. The history of the 20th Century has shown the consequences of the world's failure to learn the lessons of genocide. We have too often seen that the world will continue to suffer genocide until we emphatically reject hate and discrimination in all of its forms, and hold accountable the perpetrators of crimes against humanity. This is starting to happen. People of all nationalities in Los Angeles and around the world are speaking out for human rights and progress, and against genocide, hatred and denial. The collective actions we are taking today will undoubtedly help us shape a better tomorrow.